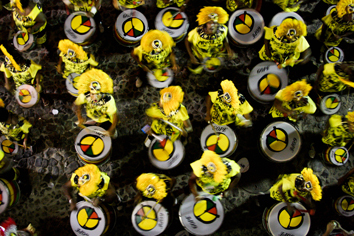 Throughout the past century, links between music and race show how rhythm, melody, harmony, and dissonance have been ever-present as Brazilians negotiate their physical and symbolic places in society. Based on long-term field research in Brazil, in this presentation North American cultural geographer and percussionist Johnny Finn will focus on two specific intersections of race and music: the transformation of samba from localized sound to national music in the early to mid-20th century; and the creation and subsequent global commercial success of samba-reggae in the late 20th and early 21st centuries. Featuring recorded music, film, photography, interactive cartography, and participatory musical performance, this multi-media presentation will explore the ways in which music is not simply an aesthetic aural art form, but an active ingredient in the ongoing processes of social life. Johnny Finn is an Assistant Professor of Geography at Christopher Newport University in Newport News, VA, USA. He received his Ph.D. in Geography from Arizona State University in 2011. His research explores how cultural forces play an active role in producing the social rhythms that resonate through all aspects of urban life. He has conducted extensive field research in Ghana, Cuba, Brazil, and along the US-Mexico border. Based on this research, Finn has published academic journal articles, book chapters, and popular press feature articles in English, Spanish, and Portuguese on subjects as varied as music, graffiti, race and urban landscapes, and cultural mapping. As a working percussionist and drummer, he specializes in Brazilian and Cuban music, and has appeared on five albums with four different groups. He regularly performs, records, teaches, and leads percussion workshops throughout the US.